Hotel Transylvania is a 2012 American 3D computer-animated fantasy comedy film produced by Sony Pictures Animation for Columbia Pictures. It was directed by Genndy Tartakovsky and produced by Michelle Murdocca, and stars the voices of Adam Sandler, Andy Samberg, Selena Gomez, Kevin James, Fran Drescher, Steve Buscemi, Molly Shannon, David Spade, and CeeLo Green. The film tells a story of Count Dracula, the owner of a hotel called Hotel Transylvania where the world's monsters can take a rest from human civilization. Dracula invites some of the most famous monsters to celebrate the 118th birthday of his daughter Mavis. When the "human-free hotel" is unexpectedly visited by an ordinary 21-year-old traveler named Jonathan, Dracula must protect Mavis from falling in love with him before the hotel's guests learn that there is a human in the castle, which may jeopardize the hotel's future and his career. The film was released on September 28, 2012, and was met with mixed critical reception, while the general public received it favorably. Despite this, Hotel Transylvania earned a total of $358 million against a budget of $85 million at the box office. The film was nominated for a Golden Globe Award for Best Animated Feature Film. It launched a franchise with a sequel titled Hotel Transylvania 2, which takes place seven years after the film, released in 2015, and a third film scheduled for 2018. A television series based on the film premiered on Disney Channel in June 2017, and it focus's on the teenage years of Mavis and her friends at the Hotel Transylvania. 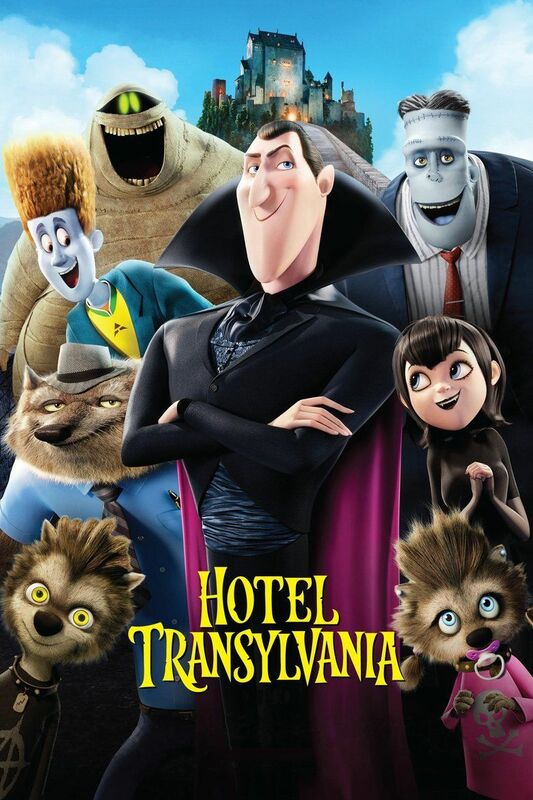 In the aftermath of the death of his wife Martha (Jackie Sandler) at the hands of an angry human mob, Count Dracula (Adam Sandler) commissions and builds a massive five-star, monsters-only hotel in Transylvania in which he raises his daughter Mavis (Selena Gomez) and to serve as a safe-place getaway for the world's monsters from fear of human persecution. Famous monsters such as Frank (Kevin James) and his wife Eunice (Fran Drescher), Wayne and Wanda Werewolf (Steve Buscemi and Molly Shannon) and their massive immediate family, Griffin The Invisible Man (David Spade), and Murray the Mummy (CeeLo Green) often come to stay at the hotel which is completely human-free and safe for monsters. On Mavis's 118th birthday, Dracula allows his daughter to leave the castle in order to explore the human world, but he sets up an elaborate plan using his zombie bellhops disguised as humans to make them seem intimidating, but without her being in any danger, and frighten her home. The plan works, but the zombies inadvertently lead a 21-year-old human named Jonathan (Andy Samberg) back to the hotel. Dracula frantically disguises him as a Frankensteinesque Monster and passes him off as "Johnnystein", 'a distant cousin of Frank's right arm'. Jonathan soon encounters Mavis and the two "Zing" (a form of romantic attraction). Unable to get Johnny out of the hotel without notice, Drac quickly improvises that Jonathan is a party planner, brought in to bring a fresher approach to his own traditional and boring parties. Jonathan quickly becomes a hit to the other monsters, especially Mavis, but this disgusts and worries Dracula greatly. Drac orders Johnny to leave, but Johnny is brought back by Mavis. After being shown the beauty of a sunrise by Johnny, Mavis is inspired to give humans another chance. Meanwhile, the hotel chef Quasimodo (Jon Lovitz) with the help of his pet rat Esmeralda learns that Johnny is a human and kidnaps him in order to cook him. Dracula intervenes and magically freezes Quasimodo to keep him from telling anyone that Jonathan is human. Dracula leads Jonathan to his quarters and shows him a painting of his wife. Much to Dracula's surprise, Jonathan knows the woman in the painting from a legend he has recently heard and relates a story about how she fell perfectly in love with a count, but died in a mysterious fire. Dracula reveals the full painting with himself in it and confirms the truth of the tale, and proceeds to tell the full version, thus explaining why Dracula built the hotel and the origin of his overprotective behaviour with Mavis. Jonathan is understanding and Dracula develops respect for his knowledge, and the two bond, recognising that Jonathan is a good person. Jonathan then tries to leave for good, but Dracula convinces him to stay for the time-being to avoid ruining Mavis's birthday. The party is a great success the next night, and Mavis looks forward to opening a gift from her deceased mother. However, when Jonathan and Mavis share their first kiss, Dracula overreacts, and, in his outburst, inadvertently confesses to deceiving Mavis with the town. A still-frozen Quasimodo bursts in and the Fly (Chris Parnell) translates from his frozen speech that Johnny is a human disguised by Dracula. The guests are outraged by the deceit at play, but Mavis is undeterred and wants to be with Johnny, even knowing he is human. Jonathan feigns disinterest in Mavis and rejects her out of respect for her father and leaves the hotel. Mavis then angrily yells at Dracula and flies off. Dracula finds Mavis on the roof with her mother's present. He learns it is a book about how her mother and Dracula "Zinged" and fell in love. Dracula realizes humankind has become tolerant of monsters, and manages to convince Frank, Wayne, Griffin, and Murray to head out into the human world help him find Jonathan, and with the scent-tracking ability of Wayne's daughter, Winnie, they learn that he is bound on a flight to America soon. The four head to the airport, but are held up in a town celebrating a Monster Festival along the way. Instead of being frightened by the appearance and powers of real monsters, the humans admire the group, and a team of men dressed as vampires help Dracula by providing him shelter from the sunlight while he rushes to the airport. Drac arrives to see Jonathan's plane taking off, and he gives chase in bat form, burning in the sunlight. After getting Jonathan's attention, Dracula makes his way to the front of the plane and uses his mind-controlling power on the pilot (Brian Stack) to help him apologize for his actions. Jonathan accepts his apology; Dracula then manipulates the pilot to return to the Transylvanian airport for a "refuel". Dracula returns Jonathan to Mavis. Jonathan confesses that their 'Zing' was mutual and the two kiss, making Dracula realize his daughter has grown up and can make her own decisions. The monsters finish celebrating Mavis's party as Dracula, Mavis, Jonathan and their monster friends sing "The Zing" to the audience of hotel guests. 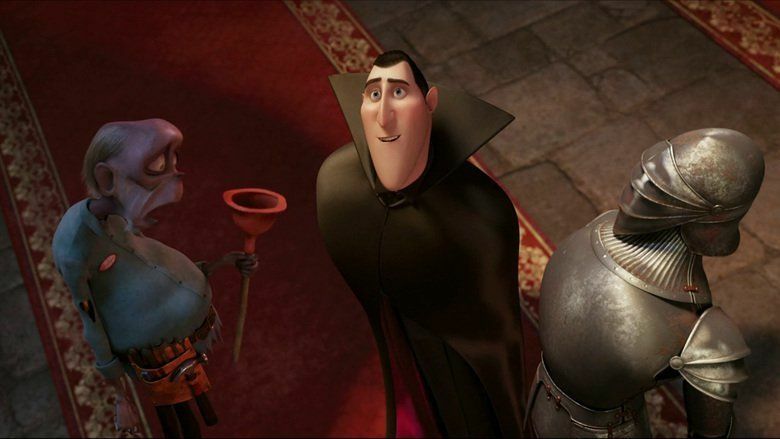 Adam Sandler as Count Dracula, the 532-year-old owner and hotel manager of Hotel Transylvania, and Mavis' over-protective father. 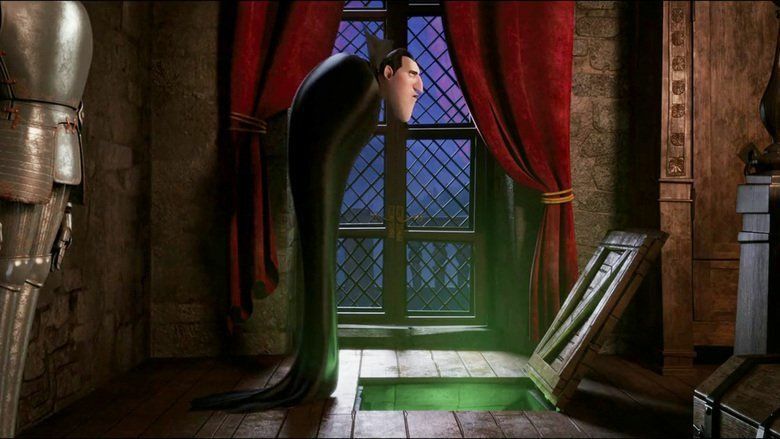 Andy Samberg as Jonathan ("Johnnystein"), a 21-year-old human who stumbles upon Hotel Transylvania in his travels. Selena Gomez as Mavis, Dracula's 118-year-old "teenage" vampire daughter who is interested in the outside world and falls in love with Johnny. Sadie Sandler voices Mavis as a child, as well as Wayne's daughter Winnie. Kevin James as Frank/Frankenstein, Eunice's husband and one of Dracula's best friends who acts as an uncle to Mavis and mostly hangs out with Murray. Fran Drescher as Eunice, Frankenstein's wife and Wanda's best friend. Steve Buscemi as Wayne, a male werewolf who is also one of Dracula's best friends and Wanda's husband. Molly Shannon as Wanda, a female werewolf, Wayne's heavily-pregnant wife and Eunice's best friend. David Spade as Griffin the Invisible Man, one of Dracula's best friends. CeeLo Green as Murray the Mummy, a short fat mummy who is one of Dracula's best friends and mostly hangs out with Frankenstein. Jon Lovitz as Quasimodo Wilson, a Hunchback gourmet chef and the former Bell-ringer of Notre Dame who desires to make a dish with human as the main ingredient. Luenell as a wisecracking shrunken head that serves as a "Do Not Disturb" sign on the door of Mavis's room. Chris Parnell as Mr. Fly, Hotel Transylvania's fitness coordinator who can also translate any speech. Brian George as a Suit of Animated Armor, the head of Hotel Transylvania's security guards. Brian Stack as the pilot of Jonathan's airplane back to America. Jackie Sandler as Martha, Dracula's wife and Mavis's mother who was killed by an angry mob when Mavis was young. Paul Brittain as a Zombie Plumber, as well as one of the Hydra heads. Robert Smigel as Fake Dracula, an attendee at a Transylvanian festival. Robert Smigel also voices Marty, a pink Gill-man at Hotel Transylvania. 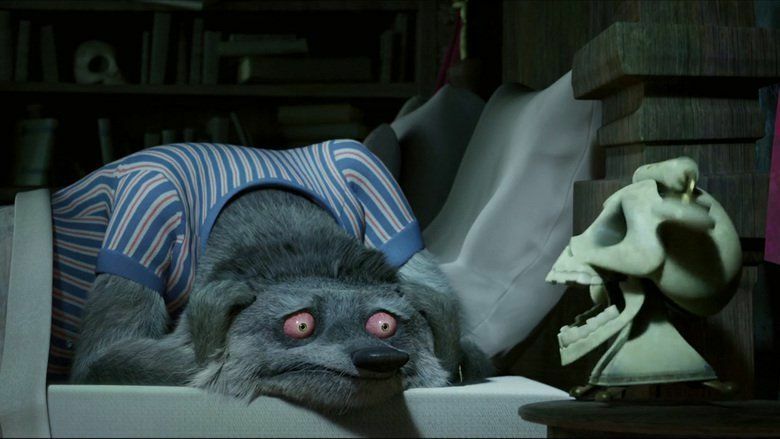 Jonny Solomon as Gremlin Man, one of the Gremlins at Hotel Transylvania. Jonny Solomon also voices one of the Hydra heads. Jim Wise as a shrunken head, as well as one of the Hydra heads. Craig Kellman as a guy who shouts in the crowd at the festival. Craig Kellman also voices one of the Hydra heads. Brian McCann as a hairy monster that almost resembles a Yeti. Brian McCann also voices one of the Hydra heads. Tom Kenny as one of the Hydra heads. James C. J. Williams as a deformed Igor-esque humanoid construction foreman who helped to build Hotel Transylvania. Hotel Transylvania was originally created and developed by comedy writer Todd Durham, which he based on his book of the same name; after creating the bible for a franchise of several films, television series, video games, books, merchandising, hotel chain, and theme park, he took the package unsolicited to Columbia Pictures and set it up at Sony Pictures Animation where he became the first of several screenwriters on the project. The development process ultimately went through six directors: in 2006 Anthony Stacchi and David Feiss became the first directors set to helm the film. They were replaced by Jill Culton in 2008, who was followed by Chris Jenkins, with Todd Wilderman in 2010. In February 2011, Genndy Tartakovsky took over as the sixth scheduled director, and made his feature directorial debut with the film. He reimagined the film to follow the energy, organic nature, and exaggeration of 2D animation, particularly as seen in the work of director Tex Avery. "I took all the aesthetics I like from 2-D and applied them here," Tartakovsky said. "I don't want to do animation to mimic reality. I want to push reality." "I wanted to have an imprint so you'd go, 'Well, only Genndy can make this.' It's hard, especially with CG, but I feel there's a lot of moments that feel that they're very me, so hopefully it'll feel different enough that it has a signature to it." In November 2011, it was announced that Miley Cyrus would voice Mavis, Dracula's teenage daughter, but in February 2012, Cyrus left the film to coordinate a musical comeback. It was later announced that Selena Gomez would replace Cyrus. "Where Did the Time Go Girl (Party Version)" Written by Robert Smigel, Adam Sandler, and Dennis White. Produced by Static Revenger. "Daddy's Girl" Written by Adam Sandler and Robert Smigel. Performed by Adam Sandler. "Call Me Mavy" Performed by Traci L.
"Problem (The Monster Remix)" Written by Henry Walter, Lukasz Gottwald, Becky Gomez (as Rebbeca Marie Gomez) & Will.i.am (as William Adams). Performed by Becky Gomez (as Becky G) featuring Will.i.am. "Overprotected" Written by Max Martin. Performed by Britney Spears. "The Zing" Written by Adam Sandler, Robert Smigel, and Dennis White. Produced by Static Revenger. Performed by Adam Sandler, Andy Samberg, Cee Lo Green, Kevin James, and Selena Gomez. "Sweet 118", written by Andy Samberg, Stuart Hart and Trevor Simpson. Performed by Andy Samberg. "Hush Little Baby", performed by Adam Sandler. "Monster Mash", performed by Bobby Pickett. Hotel Transylvania premiered on September 8, 2012, at the Toronto International Film Festival. Distributed by Columbia Pictures, the film received a wide release on September 28, 2012. On October 26, 2012, Regal Entertainment Group Cinemas began exclusively playing the traditionally animated short film Goodnight Mr. Foot before the film. Based on Hotel Transylvania, the short was directed and animated by Genndy Tartakovsky. Hotel Transylvania was released on Blu-ray (2D and 3D) and DVD on January 29, 2013. It was accompanied by the short animated film, Goodnight Mr. Foot. Review aggregator Rotten Tomatoes reports that 45% of critics gave the film positive reviews, with an average rating of 5.3/10, based on 140 reviews. The site's critical consensus reads: "Hotel Transylvania's buoyant, giddy tone may please children, but it might be a little too loud and thinly-scripted for older audiences." Another review aggregate, Metacritic, calculated an average score of 47 out of 100, based on 32 reviews. 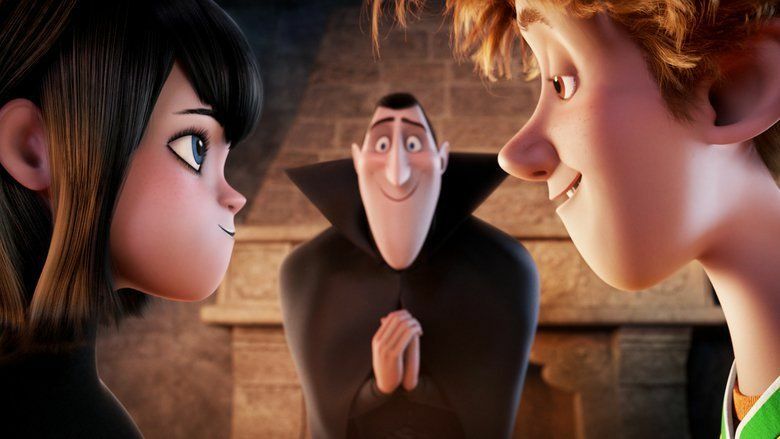 CinemaScore polls conducted during the opening weekend revealed that the average grade cinemagoers gave Hotel Transylvania was an A- on an A+ to F scale. IGN editor Geoff Chapman rated the film 9 out of 10 and wrote "This is a fun film, full of quirky gags and lovable characters. There are a few songs that smack a bit like soundtrack marketing for the kids, and the story is of course fairly predictable, but this movie is about enjoying a fun journey with great characters. It's a romp that kids and families will all enjoy. 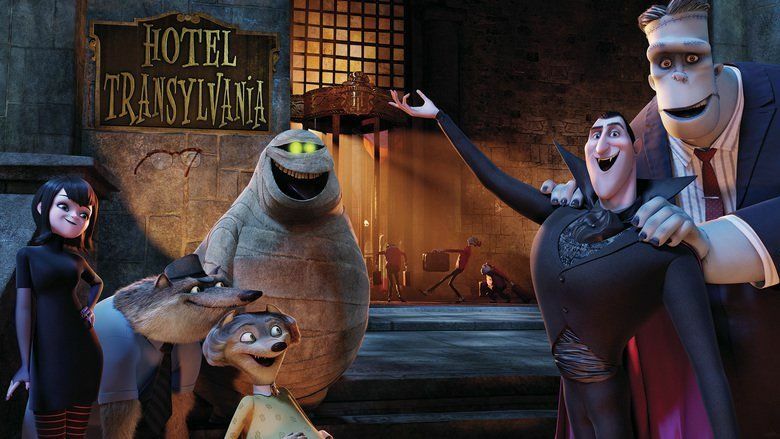 Hotel Transylvania is definitely somewhere you'll want to check in." Hotel Transylvania earned $148,313,048 in North America, and $210,062,555 in other countries, for a worldwide total of $358,375,603. The officially reported budget for the film was $85 million, although Deadline.com claimed that the film actually cost $104 million. For the film's marketing, Sony spent $52.1 million in the United States, and $31 million in other countries. Hotel Transylvania topped the box office with $11 million on its first Friday, and $42.5 million domestically and $50.6 million worldwide for its opening weekend, which at the time of its release broke the record for the largest-grossing September opening, a record which was overtaken by its sequel Hotel Transylvania 2 in 2015, with a weekend gross of $48.5 million. The film also earned the highest-grossing domestic debut for Sony Pictures Animation (also later overtaken by Hotel Transylvania 2). According to Sony's president of worldwide distribution, Rory Bruer, Sony was very satisfied with the film's performance, which was "beyond anyone's imagination, and the holds are ridiculous. It exceeds expectations in every new market it opens in." Hotel Transylvania was theatrically released in China on October 28, 2013, more than a year after the worldwide premiere, and contributed $11,180,000 to the overall gross. Another video game, titled Hotel Transylvania, developed by WayForward and published by GameMill Entertainment, was released on September 18, 2012, for Nintendo DS and Nintendo 3DS at retail. The game was also released in the Nintendo eShop in North America on November 15, 2012. A mobile game, titled Hotel Transylvania Dash, developed by Sony Pictures Consumer Products Inc. and PlayFirst, was released to iTunes App Store on September 20, 2012. The game is a variation of Hotel Dash mobile game and features the film's art and characters. A mobile digital storybook app, titled Hotel Transylvania BooClips Deluxe App, developed by Castle Builders and Sony Pictures Animation, was released to iTunes App Store, Nook Store, Google Play for the Android, iBookstore, Microsoft's Metro, and for the PC and Mac via www.BooClips.com, both in English and in Spanish, on September 20, 2012. Goodnight Mr. Foot is a traditionally animated short film based on Hotel Transylvania, featuring Bigfoot from the film. Premiering in time for Halloween, on October 26, 2012, the short was shown exclusively in Regal Entertainment Group Cinemas, before the theatrical shows of Hotel Transylvania. As Sony Pictures Animation's first traditionally animated film, it was written and directed by Genndy Tartakovsky himself, who also animated the short with the help of Rough Draft Studios. Animated in the style of Bob Clampett, Tex Avery and Chuck Jones, Tartakovsky created the short in four weeks during the final production stages of the main film. Bigfoot (who has a non-speaking role in Hotel Transylvania) was voiced by Corey Burton while the Witch Maid was voiced by Rose Abdoo. 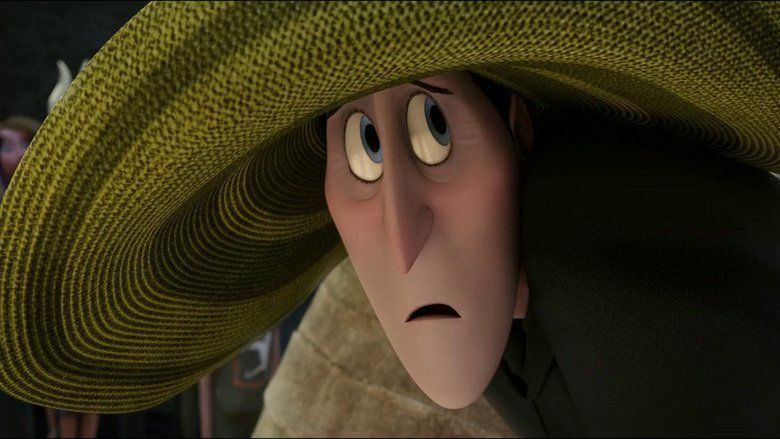 Both voice actors provided additional voices in Hotel Transylvania. A sequel, titled Hotel Transylvania 2, was released on September 25, 2015. Its story takes place seven years after the first film, with the hotel now open to human guests, and its owner, Count Dracula, having only one worry on his mind—that his 5-year-old grandson is not a pure-blood vampire. The original crew and cast returned for the film, except CeeLo Green as the role of Murray, who was replaced by Keegan-Michael Key. 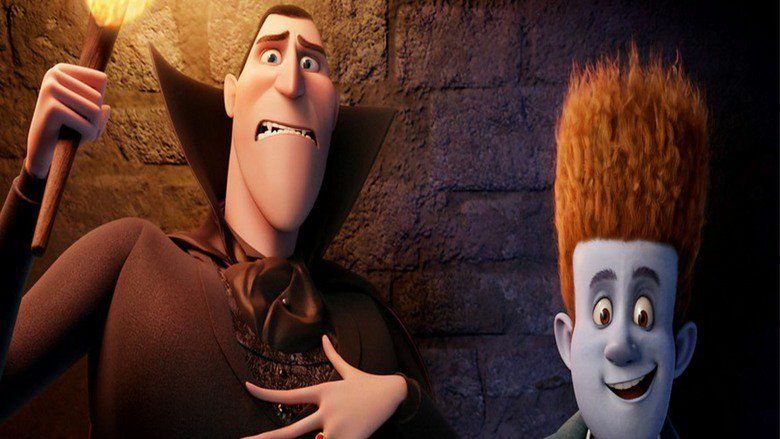 New additions include Mel Brooks as Dracula's father, Vlad; Nick Offerman and Megan Mullally as Jonathan's parents, Mike and Linda; and Asher Blinkoff as Mavis and Johnny's half-human/half-vampire son, Dennis. In November 2015, Sony Pictures Animation announced that Hotel Transylvania 3 will be released on September 21, 2018 (now July 13, 2018). Despite previously leaving the series to direct other projects, Genndy Tartakovsky will return as director for this installment. A television series based on the film will premiere in June 2017, on Disney Channel. 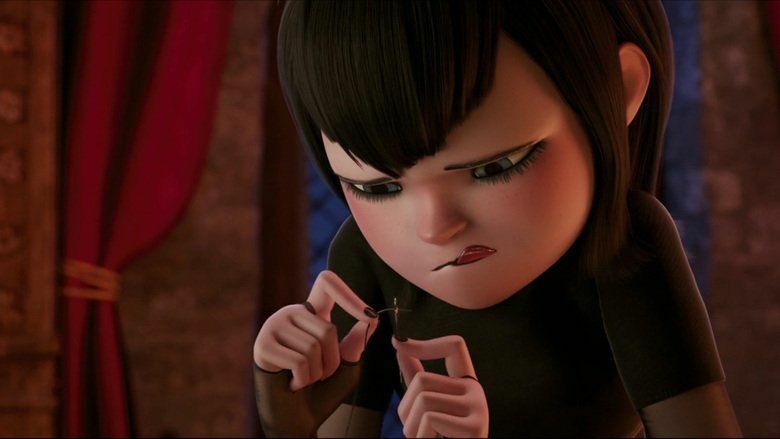 Developed and produced by Nelvana Limited, in partnership with Sony Pictures Animation, the series will take place before the first film, focusing on the teenage years of Mavis and her friends at the Hotel Transylvania.